Having travelled a fair bit in my travel blogging assignments, it’s my conviction that some of my best travel experiences are those that are least planned. I had the opportunity sometime back for a photography project for three nature lodges that are owned or co-owned by my former classmate, Alexander Yee, a socio-eco entrepreneur with a diverse portfolio of tourism-related business. Borneo is the third-largest island in the world and the largest in Asia. Also nicknamed Negeri Di Bawah Bayu -“Land beneath the wind”, Borneo is blessed with some of the world’s most biodiverse equatorial rainforests that are easily accessible. The pictures of wildlife in this travelogue are just some I captured along the short trip without much prior planning (I was there to basically shoot the interiors of the lodges and some pictures of the surroundings). Visitors can expect way much more exciting picture opportunities on a focused trip. For lovers of nature, Sabah is Southeast Asia hub for many wildlife conservation, for endangered species like the Proboscis Monkeys, Orang Utan and Borneo Sun Bear. A female Orang Utan with her baby spotted along the conservatory broadwalk at the Sepilok Orang Utan Rehabilitation Centre. Today around 60 to 80 orangutans are living free in the reserve. The centre is a magnet for tourists and researchers alike, giving them the rare chance to observe the primates up close in their natural habitat. A boardwalk leads to a viewing gallery and feeding platform where the apes are fed fruits and milk twice a day at 10am and 3pm by rangers. But don’t expect any performance as this is a rehabilitation centre and the orangutan that comes to the feeding session solely on its own free will. More often than not, a free meal is a great motivation. Visual-assist gears are set up along the boardwalk for visitors to better spot the primates among the forest. For visitors and especially photographers, please be advised that NO bag/camera bag is allowed to be brought into the centre. Movement is restricted to walkways and visitors are not permitted to approach or handle the apes. The Bornean Sun Bear Conservation Centre, just 1min drive from the Sepilok Orang Utan Rehabilitation Centre, is a wildlife conservation and research centre for improving animal welfare and rehabilitation of the Malayan sun bear. Some of its objectives are also to raise public awareness about the plight of the sun bears and conservation awareness about this species which falls under the Totally Protected category. For city folks who are weaned on clean and comfy accommodation, a stay on a nature trip to Sabah need not be among the thick Bornean forest. This is where the conveniently located Nature Lodge Sepilok shines. The serene and cosy ambience at the lodge, which opened in July 2016. The duplex style chalets are on the left in the picture with king or double single beds layout. The lobby and reception area on the right side of the picture. You can expect to be remembered and be addressed by your name at this lodge. The lodge is just a 1.2-kilometre walk from Sepilok Orangutan Rehabilitation Centre and only 800 metres from the gorgeous Rainforest Discovery Centre, Operated by Nasalis Larvartus Tours which runs Nature Lodge Kinabatangan, it makes seamless connections easy if you plan on visiting the Kinabatangan River (about 45min – 1hour drive away). The duplex chalet-style huts are tastefully decorated, with polished wood floor treatment plus neutral tones and comfortable beds. Hot-water ensuites are clean and the bath amenity is within a mini private outdoor garden. WiFi is available but strongest in the lodge admin office or lobby area. Fancy a shower or nature calls among open-air setting? No worries about peeping-tom as the lodge perimeter high-wall are fringed by thick vegetation. The dormitory-style accommodation at the lodge. The dorms are mixed but staff will segregate sexes if the numbers work (which is good if you happened to be the only person of that gender at the time — you’ll get the whole room to yourself). Clean, spacious, airconditioned and comfortable with a mattress on a wooden bunk. Lockers are not available so do bring a lock for your own bag. The lodge only restaurant. Food is delicious while the menu range is good and reasonably priced. During my breakfast, ants competed with me at the bottle of marmalade. A feedback to the staff quickly rectified the situation, no harm done. Fruit trees around the lodge perimeter do not belong to the lodge owner but the local rules are that you can take some for private consumption but not harvest it for sale. I was lucky as the rambutans were in season. The organically grown fruits were certainly succulent and sweet but the ultimate fun was plucking it yourself from the branches. The Kinabatangan River is the longest river in Sabah emerging high in the Crocker Range and travelling 560km down to its mangrove swamp estuary into the Sulu Sea on the east coast of Sabah. This river is amazing for its unique and rich ecosystem. The wildlife in the lower reaches of the Kinabatangan River is spectacular and widely accepted by naturalists to be the most varied and easily accessible wildlife in all of Southeast Asia. This is where Nature Lodge Kinabatangan is strategically located to ensure visitors enjoy a decent level of comfort while enjoying jungle adventures. The lodge is only accessible via a short few minutes boat ride across the river from Kampong Bilit. For city folks like me, this has to be my most exciting introduction to jungle experience to date. One of two jetties to the lodge. If ambience like this doesn’t put you in the mood for a rumble in the Borneo forest, you are certainly in the wrong place. The boardwalk leading to the chalet-style accommodation called the “Agamid” wing. Agamid refers to a lizard of the Agama family. Among the harsh environment of the Borneo rainforest, I can state with conviction, this is considered luxurious by any standard. Just look at the clean, comfy beds and well-maintained airconditioned room. Not so basic after all. The Wifi strength is weak and erratic but bearing in mind this is in a remote part of the Borneo forest, it’s a crime to complain. You will be pleased with the ensuite bathroom with water heater, definitely a world of difference with the Bornean rainforest out there. For eco-conscious consideration, guests need to bring their own toiletries. Clean towels and toilet papers provided, no worries. The lodge dining venue. Food served while not of super wide range as in 5-stars resorts buffet lines, were delicious and no guests will go away feeling hungry. Guests are alerted when meals are ready by the gentle sounding of a gong by the kitchen staff, definitely keeping with the village theme concept. 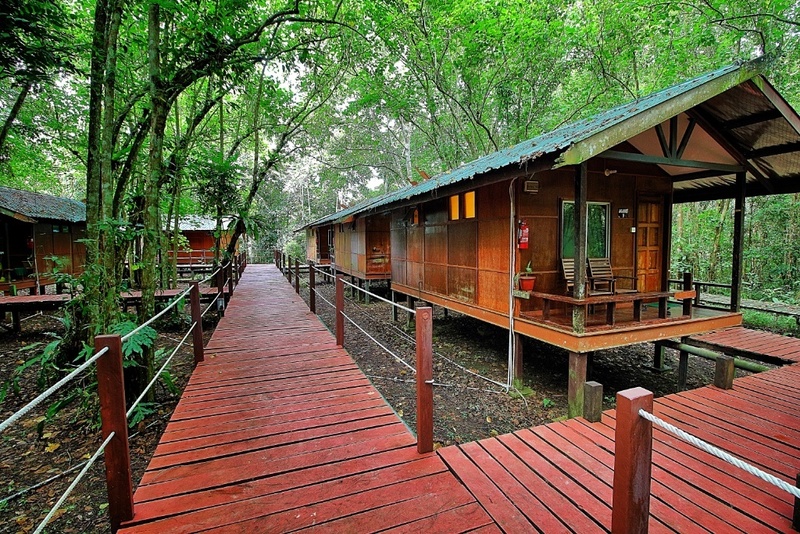 Typical of most nature lodges in the rainforest is the provision of a guided jungle trail walk. Being in the heart of nature means trails at this lodge just steps from the chalet. The following are some pictures of the animals and insects captured during a night walk. I didn’t manage to spot the Tarsier, a softball-sized, primitive primate with big-eyes but the experience was still memorable. A Borneon Tree Frog waiting for a meal to fly by. My guide called this “Daddy Long Legs Spider”. I thought he was joking but a check with Google confirmed it. A couple of Blue Flycatchers resting on a tree stem. They appeared to be awake but did not fling even when I closed in to get tighter shots. A black-backed Kingfisher resting (guide told me it was sleeping). Only at night can I possibly come this close to the bird. I used my 200mm lens almost at its minimum focus distance (about 120cm away with the bird lighted by the guide’s LED torchlight). A stick insect resting under a leaf. Amazing how wildlife can be enjoyed even in the pitch dark forest. Just remember to bring along a good LED torchlight. On the day of my departure, I “made acquaintance” with a huge friendly carpenter bee (about 5-6cm in length) which circled around me 4-5 times, each time landing at the same spot close to me as if asking me to shoot its picture. Certainly friendly wildlife here, both big and small. I like to call this little gem of an island one of the best-kept secrets of Sandakan. It is situated on the northeast coast of Sandakan. This small island is perfect for those yearning for some quiet place to unwind and relax. It has a long stretch of beach, good clear waters (subject to tidal condition) and spectacular sunrises. Depending on the travel season, you could be the only guest on the island other than the villagers here. That is how exclusive it can get on this island. Villagers here are mainly boat makers, fishermen or fishnet-makers. Do be advised that there is no internet on the island. So do inform your loved ones prior departing for the island to avoid triggering any unintended alarm. Upon arrival, the sanctuary staff rows out their boat to pick up guests from their company owned/operated high-speed boat slightly out at sea. The seabed here is rough with corals and stones so do put on your footwear. At the sanctuary turtle eggs incubation site. The eggs deposited by wild turtles that come ashore are diligently recorded before being transferred here to be safeguarded for hatching. Newly hatched hawkbills babies within an enclosure. If left in the natural environment, many of these juveniles would be quickly decimated by predators. At this site, the hatchlings are transferred to a secured holding tank to stabilise them prior release at a safer timing. It’s estimated that only 1% of these hatchlings will make it to adulthood. All staff (and the owner) are certified and trained to handle the turtles. Since its opening in 2013, the sanctuary has collected almost 33,000 eggs and marked its epic milestone when it successfully released its 30,000th live hatchings on the 1st Mar 2018. This is certainly a labour of love and unwavering commitment to the ecology. Alexander’s selfless contribution to the ecology and turtles conservation are even featured on Discovery Channel. You can watch the turtle conservation segment from 8.30 onwards. Alexander with a quartet of hatchlings prior release. They are allowed to forage on the beach so to induce mind “imprint” to maximise on the possibility that it will return in the future to lay eggs on this island. A baby hawksbill turtle swimming out to sea. The Walai Penyu Libaran glamping site can be seen in the background. The glamping site has 8 purpose-built tents for guests to stay over at the island in relative comfort. To minimise the effect of heat and wind from affecting the tents, an extra layer of heavy duty roofing material was set up to ensure guests comfort. Imagine 6 inches thick mattresses are used on the wooden bed frame for a good night rest. Bottled drinking water, insect coils, insecticide and cloth rack are provided too. Even a writing table and thick floor rug are part of the creature comfort furnishings. Clean and neat washroom, with enclosed WCs. Not too shabby definitely. The water pressure is not too great but you can still enjoy a great shower here. The campsite at night. The dining area is just behind the sundeck benches under the canopy. Perfect place to chill out. But the power generator is switched off by late night (about 10 pm onwards) to ensure a conducive landing ambience as turtles avoid unnatural sound and light. Due to the low-light pollution, the Milky Way and the stars constellation can be easily seen on a cloudless night. A huge mangrove crab (about 25cm across) along the beach at night. I did not have the luck to spot a turtle landing during my stay but the indigenous wildlife on the island is enough to keep me occupied. Like the giant geckos and also huge holes made in the beach area by the big mangrove crabs. A beautiful Skink Lizard sunning itself on the driftwood just steps from the campsite. Opportunities abound for nature photographers who look for them. A beautiful sunrise greets guests daily, truly living up to Sabah’s reputation as having one the best sunrise and sunset in Asia. A visit to Sabah naturally draws the visitors to the beauty of nature that may be lost on city folks in their built-up concrete jungle. The “land beneath the wind” has such wide range of sheer beauty, both nature and culture, that a visit to Borneo should be on everyone’s must-do list. Don’t take it just from me, a visit will convince you. I hope my short blog helps in some ways to open readers’ eye to this amazing place. Thanks for coming on my pixels journey. For travel ideas to the region and further, please feel to check out my travelogues here. Footnote – All pictures used in this blog are copyrighted to Jensen Chua Photography and Nasalis Larvatus Tours Sdn Bhd. All rights reserved.